Spanning about 22 kilometers (14 miles), Valles Caldera in New Mexico was formed from the collapse of a magma chamber following ancient volcanic eruptions. 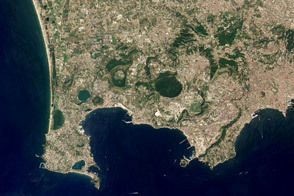 The Enhanced Thematic Mapper Plus on Landsat 7 satellite captured this natural-color image of the area on May 22, 2002. 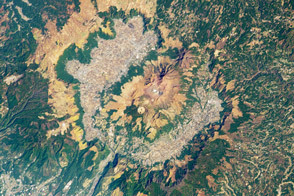 Plants have colonized parts of the caldera, which is surrounded by a network of valleys. 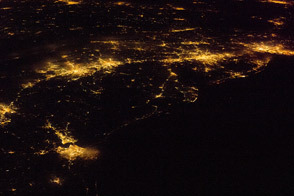 The city of Los Alamos lies to the east. Valles Caldera is a complex formation resulting from two high-volume eruptions that occurred during the Pleistocene Epoch. Eruptions about 1.7 million and 1.2 million years ago pushed up magma that was rich with water and granite. When the magma broke through overlying rock layers, its water content turned to steam, driving powerful eruptions that buried the surrounding area in layers of volcanic ash—hundreds of meters thick in some places. As ash and steam billowed overhead, magma under the surface dwindled. In the eruption 1.2 million years ago, a giant rock plug descended into the magma chamber, leaving steep rock walls around its perimeter. Landslides toward the chamber quickly followed. Over thousands of years, however, the caldera floor slowly rose. Today, hot springs and fumaroles persist at Valles Caldera. The volcanic ash that sprayed over the landscape during the Pleistocene later hardened into the Bandelier Tuff. Parts of this porous volcanic rock later became home to Ancestral Pueblo people who carved cavates. Some of these ancient dwellings are now preserved at Bandelier National Monument. 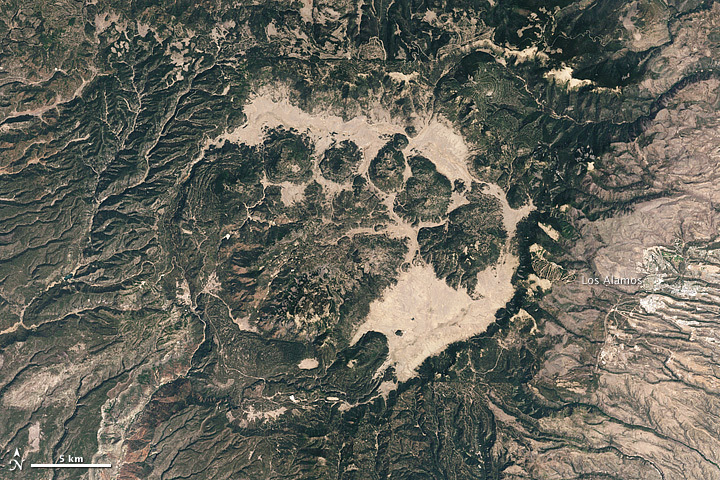 Acquired May 22, 2002, this natural-color image shows Valles Caldera in New Mexico. Global Volcanism Program. (n.d.) Valles Caldera. Smithsonian Institution. Accessed May 19, 2011. Treiman, A. (2003, September 6). 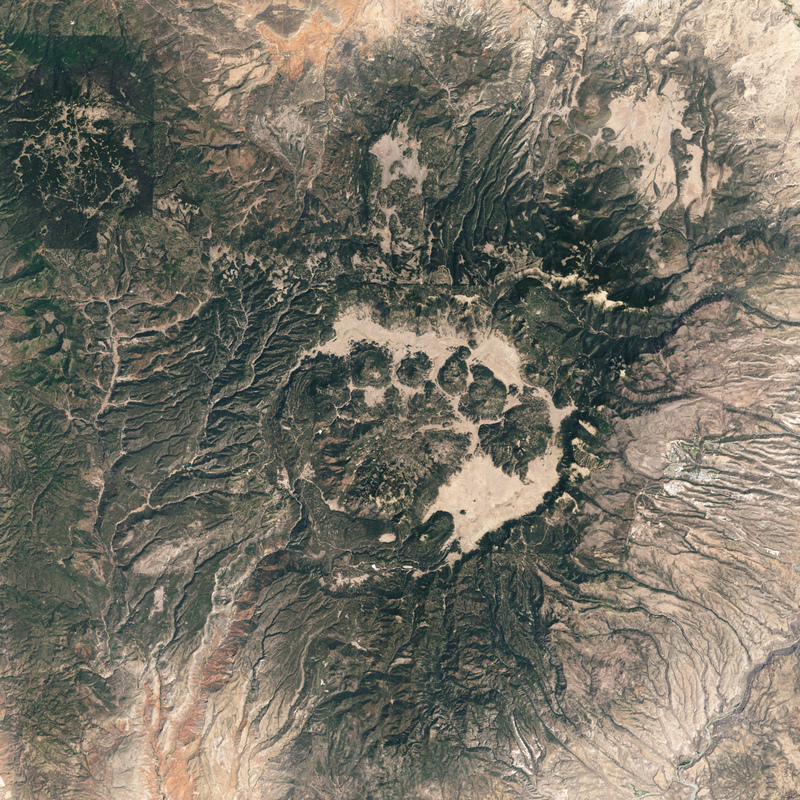 Valles Grande Caldera – Geologic History. Accessed May 19, 2011. U.S. National Park Service. (2011, May 5). Bandelier National Monument. Accessed May 19, 2011.